for a commemorative photo at Lynn Hall in conjunction with the 2017 White Coat Ceremony. 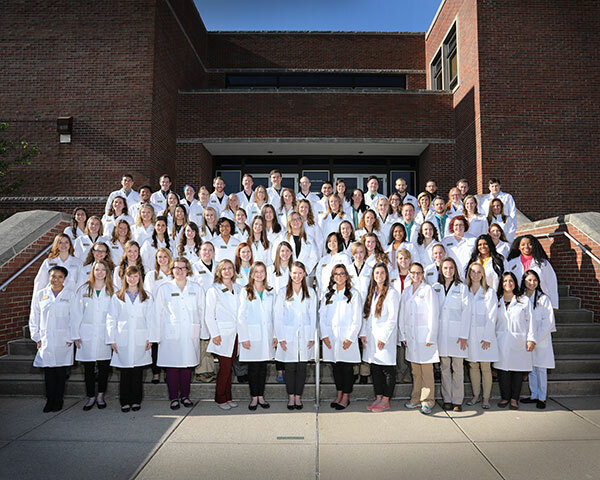 April 9 marked a momentous occasion for members of Purdue Veterinary Medicine's DVM Class of 2018 as they took part in the College's White Coat Ceremony in the Purdue Stewart Center's Fowler Hall. 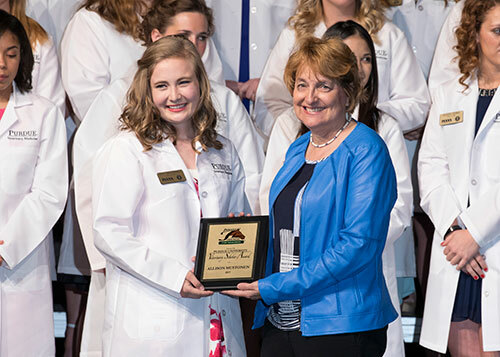 Previously held in conjunction with the College's Honors and Awards Banquet, the ceremony was conducted as a stand-alone event this year, when the students who are entering their final year of the DVM program officially receive their white coats symbolizing their new role as junior veterinarians. A tradition that dates back 16 years, the program is sponsored by Hill's Pet Nutrition and Elanco Animal Health. After welcoming all those in attendance, including friends and family members, Dean Willie Reed explained to the Class of 2018, "The white coat indicates your acceptance of your great responsibility toward your patients and clients, your commitment to show compassion and empathy, and to make a positive difference in the life of every animal and person with whom you come into contact." Looking ahead, he added, "Four weeks from tomorrow, you will begin your clinical year during which you will be interacting with Veterinary Teaching Hospital clients as veterinary professionals. This is a big responsibility!" PVM Associate Dean for Academic Affairs Kathy Salisbury then introduced the class members individually as they walked onto the stage where Dean Reed helped them don their white coats. Each student posed for an official photo with Dean Reed and then received a name badge from the Indiana Veterinary Medical Association (IVMA). This year, PVM alumni also had the opportunity to take part in the program through the sponsorship of a white coat. Additionally, inside the pocket of each white coat, students received a note from a PVM alumni member offering words of encouragement about taking this next step in their career. The program also included remarks by DVM Class of 2017 member Kristen Puls who shared words of wisdom from her clinical experiences before Dr. Stephanie Thomovsky, clinical associate professor of veterinary neurology in the Department of Veterinary Clinical Sciences, offered her perspectives. Dr. Thomovsky was selected by the Class of 2018 as the faculty member from whom they wanted advice about beginning their clinical year. The ceremony was followed by a light reception for attendees. Photos of the White Coat Ceremony were taken by professional photographer Ed Lausch and are available to be viewed and purchased online at www.lauschphotography.com. Enter the Username "2017whitecoat" and the Password "april2017" to view the photos. Congratulations to the DVM Class of 2018! 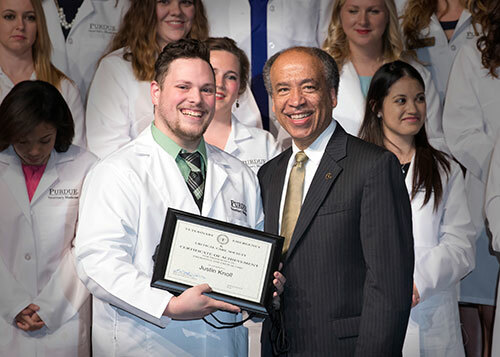 Zoetis VECCS Award for Proficiency in Emergency and Critical Care honoree Justin Knoll, of the DVM Class of 2018, with Dean Reed at the 2017 White Coat Ceremony. Dr. Sandi Norman (PU DVM '80), of the Indiana Board of Animal Health, presents Allison Mustonen, of the DVM Class of 2018, with the Indiana Horse Council Equine Industry Award.